We Do Protect Our Client ! With today’s strongest health regulations, hygiene is a growing concern for today’s spa to clients. Angel nail is proud to introduce the new CLEANJET Pipe- free Pedicure system. The CLEANJET Pipe-free Pedicure system prevents stagnant water and bacteria build up, thereby reducing the risk of bacterial infections and disease caused by contaminated foot spas. 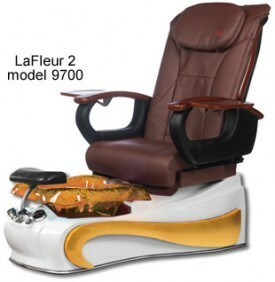 The roller massage chair provides your clients with a heated seat and 6 massage motors to hit all the right spots. Hand held remote allows client to customize relaxation with adjustable settings. Shiatsu is an old, traditional Japanese healing method. Shiatsu means ‘finger pressure’. Unlike other massage techniques, pressure is key with a shiatsu massage. A shiatsu massage consists of palms, fingers, thumbs, knuckles, elbows, knees and the feet, to work on the body’s meridians or energy channels. It helps to balance a persons energy flow, and strengthen the vital organs. The shiatsu massage works on applying pressure to the appropriate points.TheÂ Shiatsu chair has a state-of-the-art system which provides your clients with a hand held remote to choose between 3 different functions: roller back, kneading and massage.